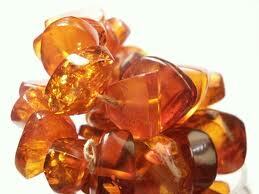 Amber is a metaphor in perfumery. Many casual perfume users appear to think that amber stone is somehow implicated, but it is not. Although both amber (fossilized tree resin) and ambergris (a concretized substance excreted from the intestines of sperm whales) used to wash up on the shore and so were sometimes confused, perfumers have not been able to make much use of amber stone in their work because it does not create the scent which they seek. In creating an amber effect, there is no single substance in nature which perfumers collect up to melt, distill, condense, and extract essences from in order to build a perfume. No, what we refer to as amber is constructed, often of labdanum, benzoin, and vanillin, but other components are sometimes used as well, and these may be combined in varying proportions to produce distinctive interpretations of amber. Still, there is something, a specific type of scent, to which the term amber refers in perfumery, though it is not a monolithic thing. In the simplest amber perfumes, embellishments are eschewed, with the result that a perfume such as L'Artisan Parfumeur Ambre Extrême may seem more like a base than full-fledged perfume. Still, some people enjoy that and similar creations precisely because they are so simple. They ask for amber, and L'Artisan Parfumeur delivers just that. I have tried a few amber perfume oils, including one by Sage and another by Sarah Horowitz, which offer a direct amber experience unmediated by (detectable) spices or leather or flowers. Such perfumes exhibit slight variations, and they usually do contain different notes, but they all smell much more like one another than any of them smells to anything else. People who are not wooed by unadorned amber oils or perfumes may still love amber, but they are looking for a bit more. Often the added elements are oriental in nature, and that may be why so many amber creations are categorized as oriental perfumes, though in some ways they deserve their own category. This amber perfume is said to contain 114 components, so obviously it is not a simple composition. I am not actually sure whether I should be impressed by the magnitude of that number or not, as I have no idea what the average number of components in a perfume is. I imagine that it is often rather large, since amber certainly isn't the only metaphorical, constructed note in perfumery. Perhaps the choice of Ambre 114 as the name of this creation was more a matter of convenience than an effort to impress. Lest we forget, Chanel no. 5 became the name of a legendary perfume because it was the fifth prototype which the perfumer had created for Coco Chanel, and it happened to be the one which she selected to be Chanel's first perfume. In any case, whether 114 is a large number or not relative to most perfumes, Ambre 114 is certainly deceptive in its complexity, for no one, I think, would ever have guessed that there were so many different elements combined in this seemingly straightforward amber perfume. To my nose, Ambre 114 is buttery and somewhat sweet, especially when compared side-by-side to other niche perfumes familiar to me. It is not a sweet perfume per se—certainly not gourmand or fruity—but it seems to me sweet relative to other amber perfumes. I find this creation considerably more appealing than most amber oils, so it must be some of the 111 other elements—besides labdanum, benzoin, and vanillin!—which I find to be compelling. Still, I must confess that it is impossible for me to tease out what they might be. Ambre 114 offers a rich blanket of beautiful golden amber which never becomes boring, despite the fact that I do not identify any flowers or woods or leather or fruits or spices. This smells like the idea in mind to which the term amber has come to refer, and yet I find it to be considerably more appealing than L'Artisan Parfumeur Ambre Extrême or any of the amber perfume oils I've tried. To my nose, Ambre 114, is a full-fledged and compelling amber perfume, while at the same time being only an amber perfume, as contradictory as that may sound. I have a difficult time finding Serge Lutens creations which I have any real desire to wear as perfume. Many of them seem more like thrill-rides, which I'm always happy to have experienced once but don't really feel the need to repeat—especially when they are as unforgettable as Chypre Rouge or Arabie or Cuir Mauresque or Serge Noire or Datura Noir, to name but a few off the top of my head. Unique those creations certainly are, but not all that pleasurable for me to wear, though I imagine that one could acquire a taste for any one of them, if for some reason one wished to do so. Ambre Sultan is a felicitous exception to the rule, defying my general difficulty in finding Serge Lutens perfumes which do not require some sort of intensive olfactory bootcamp in order to be able to appreciate. Perhaps this is simply because, out of all of this house's offerings which I've tried to date, Ambre Sultan is the most orthodox perfume. It really does smell like an amber perfume. To say that Ambre Sultan is recognizably an amber perfume is not to suggest that it does not stand out from the amber crowd, for it does, especially in the opening minutes, when a delightful herbaceous quality lies like a web on top of the amber base. But as Ambre Sultan dries down, it moves closer and closer to an unadorned, minimalist amber such as L'Artisan Parfumeur L'Eau d'Ambre or Ambre Extrême. Still, there is a consistent and persistent (albeit subtle) woody quality to Ambre Sultan which makes this creation seem more of an oriental woody than a simple amber perfume. However, I should say that I only really take conscious note of the herbaceous quality and the woodiness in the drydown of Ambre Sultan when I compare it side-by-side to other amber perfumes. That is when the uniqueness of this creation becomes clear. Worn alone, Ambre Sultan seems very much an orthodox amber perfume. But I love it and am happy to have discovered a Serge Lutens creation which belongs in my collection and which I hope to acquire soon! Ambre Sultan has always been one of my favorites, sherapop. Glad you found room in your collection for this must have from Serge Lutens.